Getting ready for your next show? Ark Country Store has several shop pig supplement options to consider. Our knowledgeable staff can help you with these products. High Octane® Fitter 52 is a high protein show supplement for pigs, lambs, goats and cattle fed for an exhibition. The amount of feed per day depends upon the species, age, and weight of the animal (lighter or younger animals need less per day). Feed according to the following: Pigs 4 to 16 oz per day; Lambs 4 to 8 oz per day; Goats 4 to 8 oz per day; Cattle: Steers 8 to 16 oz per day; Heifers 16 to 24 oz per day. High Octane® ALLEVIATE™ Supplement for show cattle, pigs, lambs, and goats is formulated to support optimal pH in the digestive system of animals. It is estimated that over 80% of show pigs experience gastric health issues affecting overall performance. Acidosis (the result of low rumen pH) causes ruminants to be off feed with digestive stress. 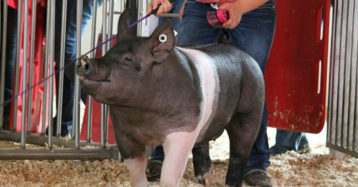 SHOW PIGS: Feed 2 ounces per day for every 50 lbs. of body weight up to 6 oz per day under normal feeding conditions. (example: 50 lb. pig = 2 oz/day; 200 lb. pig = 6 oz/day). During periods of stress, feed an additional 2 oz/day during the middle of the day as a treat or snack. The peak period of stress is usually 150 lbs. to show. This entry was posted on Sunday, January 27th, 2019 at 10:05 am	and is filed under News & Updates, Show Animals. You can follow any responses to this entry through the RSS 2.0 feed. Both comments and pings are currently closed.